This home will exceed all your expectations! 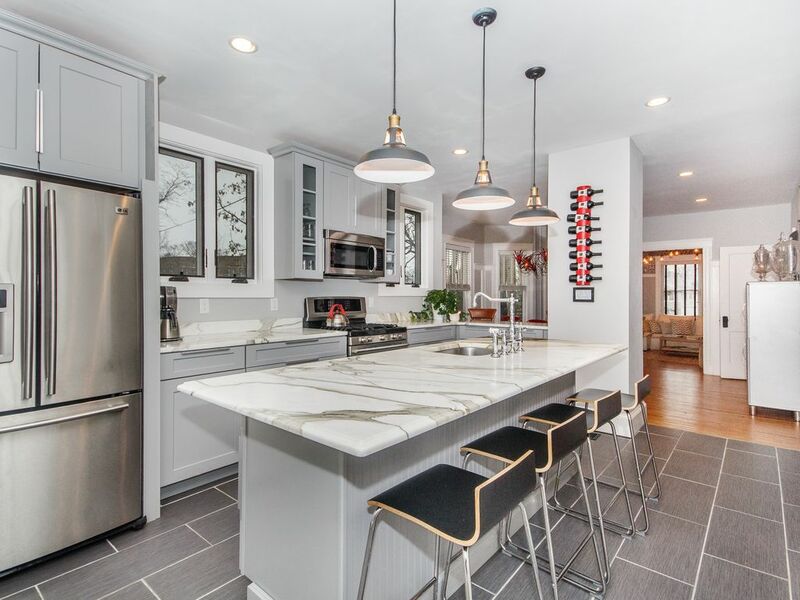 Amazing renovations w/ architectural touches and an eye for design like no other in Boston's Hip Jamaica Plain neighborhood. Easy and quick 10 mins. to downtown by bus and train or a quick drive. Across the street from one of Boston's best restaurants 10 Tables and over 20 bars and restaurants within walking distance. Just steps to shops, funky cafes and pond with jogging trail. Near hospital district and T.
A kitchen straight out of Metropolitan Home Magazine. Distressed black cabinets, Statuario marble counter and Bosch appliances. Kitchen is open to huge dining room and living room with great modern fireplace, crown molding, modern wainscoting and tons of light from 9 huge windows. Bathroom out of the pages of Domino Magazine with marble counter, vessel sink, subway tile and brushed aluminum Kohler fixtures. 2 bedrooms on 2nd floor look out onto a beautifully manicured gardens and trees. The bottom level of this triplex home features a huge bedroom and bath. marble top vanity and outstanding design! new central AC system which most Boston homes do not have! Great house for what we needed. Tv doesn’t work in basement. I would rent this house again. A guest must have taken the Roku out of the TV but it has since been replaced and TV works fine now. Thanks again for staying and glad you enjoyed! We had a group of 5 moms and 8 teenagers and the house was the perfect size and layout for us. The kitchen was big enough for our group and having the basement was great for the kids. Plenty of dishes for all of us. I wish they had had salt and pepper but other than that we had all we needed. It’s a great location. 2 minutes from the bus and about 11 minutes from the train. We had no trouble getting everywhere we needed to go. It’s a safe area and a few of us ran around Jaimaca Pond and loved it. There is a grocery store near by too. We had to contact Jeremy once for a minor issue and he got back right away. He was very easy to work with. I would highly recommend going to this home and would like be to go back again! Really happy you guys enjoyed the space and thanks for staying. It is nice to hear when people have a great time. We try to keep it up to date and make sure the home is in great shape for all to enjoy! House was spotless and well appointed. Lovely decorations and very comfortable. Great space for spending time together —yet space enough to be separate for down time too. Our family had a wonderful time in Boston. The only thing I would say to help future visitors is to let them know of your HE washing machine and the need to bring that kind of laundry detergent. Also, please think about a new mattress in the upstairs small bedroom. I felt a coil in the middle of the mattress where my 10yr old twins slept. All my family loved the home and we even at a meal on the picnic table on the deck! Allow a 15 minute walk to the Orange line subway. It’s a very beautiful well maintained home. We were 10 members in our family and more than enough room. I would definitely recommend this home to anyone. Jamaica Plain is a neighborhood in Boston which is adjacent to downtown and less than 10 minutes by T to downtown. Also a bike trail into Boston Downtown. JP is a very artistic lively neighborhood with over 15 great restaurants within 5 minutes walk from home, cafes and shops steps away from the house. A few blocks away is also Jamaica Pond with walking and bike trails around it.